In 1899 Jeremy, a young engineer, leaves a small town in Maine to oversee the construction of a railroad across East Africa. In charge of hundreds of Indian laborers, he soon finds himself the reluctant hunter of two lions that are killing his men in almost nightly attacks on their camp. Plagued by fear, wracked with malaria and alienated by a secret he can tell no one, he takes increasing solace in the company of the African who helps him hunt. In 2000 Max, an American ethnobotonist, travels to Rwanda in search of an obscure vine that could become a lifesaving pharmaceutical. Stationed in the mountains, she closely shadows a family of gorillas, the last of their group to survive the encroachment of local poachers. Max bears a striking gift for understanding the ape's non-verbal communication, but their precarious solidarity is threatened as a violent rebel group from the nearby Congo draws close. 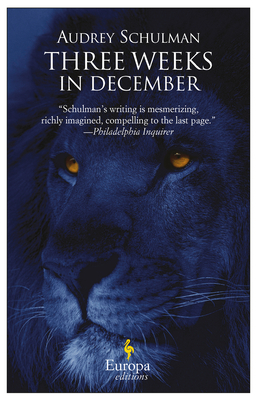 Audrey Schulman is the author of three previous novels: Swimming With Jonah, The Cage and A House Named Brazil. Her work has been translated into eleven languages. Born in Montreal, Schulman now lives in Massachusetts. "Audrey Schulman does a beautiful job of balancing adventure, suspense and self-discovery." "[A House Named Brazil is] Quirky and thoughtful... Schulman renders the strange beauties of a world that draws on resources scarcely known to us." "A genuine page-turner with literary content." "Lyrical . . . Suspenseful . . . Schulman's heroine [in The Cage] is a true original transformed emotionally and physically by experiences marvelously imagined and compellingly described." "Bizarre yet intriguing . . . More than enough to keep readers turning pages. . . Schulman's language is lovely."